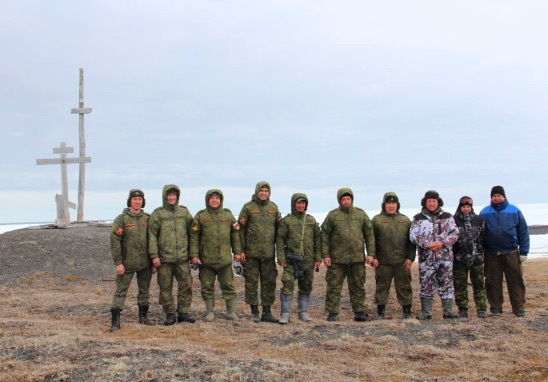 About 30 top-trained servicemen from the Northern Fleet are taking part in a major exploratory operation through the northern parts of the Arctic archipelago. Northern Fleet landing vessel «Georgy Pobedonostev» in early August sailed into the Krestovaya Bay on the western coast of Novaya Zemlya and set ashore a group of well-prepared contract soldiers from the Northern Fleet. With them, they had five powerful Vityaz DT-30Ps, the multi-purpose tracked carrier capable of operating in the most complex terrains. The group is part of an expeditionary force that will make it across the Northern Island, one of the two islands on the archipelago. From Krestovaya Bay, they drove eastwards to the Neznaemy Fjord on the Kara Sea coast. Then they proceeded northwards all the way to Russkaya Gavan, the major bay on the northern part of the island, and from there towards Mys Zhelania, the northernmost point on the archipelago. The whole expedition is expected to last about one month, the Northern Fleet informs. The participants are the same the ones who took part in two major expeditions across the southern parts of Novaya Zemlya in June and July. They all belong to the Northern Fleet’s infantry and coastal forces and are considered among the best prepared contract soldiers. They and have all undergone special training in extreme Arctic conditions, the Northern Fleet says. Novaya Zemlya is the biggest archipelago in the Russian Arctic. It is a heavily militarized area under strict control of the Russian Armed Forces. Only about 100 kilometers south of Krestovaya Bay, the starting point of the current expedition, is the point of testing of the so-called «Tsar Bomba», the most powerful explosive ever detonated. The nuclear bomb that had a yield of 50 megatons of TNT was dropped from a Soviet bomber over cape Sukhoy Nos in October 1961. Parts of the archipelago remains heavily affected by the comprehensive nuclear weapons testing. However, the lion’s share of Novaya Zemlya is untouched and clean Arctic lands. About half of the archipelago’s northern island is covered by glaciers.